A profit and loss statement, sometimes referred to as a P & L, is an important document for a business. A profit and loss statement is a financial document used by businesses to evaluate the financial status of their company within a given time period. Within this specified period of time, usually a quarter, a profit and loss statement lists all of the accounts receivable and accounts payable of a business. The profit of a business is defined as money that is available once the company subtracts all of its expenses from the incoming funds. A loss is something that a company does not get paid for. Two common losses include delinquent accounts and depreciation of assets. A profit and loss statement can be used for many purposes. A profit and loss statement may be used by a company owner or corporate officers. It may even be generated and discussed during shareholder meetings. It can show a company where it has grown and where there needs to be an improvement. For business owners who need financial backing, a profit and loss statement may be requested by potential investors or loan officers because it gives them insight on the financial performance of your business and enables them to determine whether or not you will be able to pay back the loan or the investment. Create a free Profit and Loss Statement in minutes with our professional document builder. What are the Components of a P&L Statement? Because a profit and loss statement is a financial document, there are simple math formulas that you can use to determine your gross margin, net operating profit, net profit before taxes, and your actual net profit. This formula is a form of basic accounting where revenue is posted as it is earned, and expenses are posted as they are incurred to produce revenue. This ‘accrual method’ type of accounting is used to ensure that revenue and expenses match, and that calculated figures are accurate in the given month, quarter, or year. Using the accrual method of accounting keeps cash flow from the cash flow statement completely separate from activity in the income statement because the income statement posts revenue and expenses without regard to cash that moves in or out of the business. The net income of the income statement is transferred over to the equity section of the balance sheet. Income statement amounts begin each period with a zero balance, while balance sheet amounts are carried over from one period to the next. 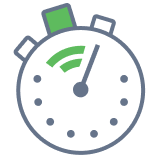 At the end of each accounting period, whether it is each month, quarter, or year, the preparer will close their books by resetting all of the company’s expense and revenue accounts to zero. The total revenue (less expenses) is posted to net income, which, in turn, increases the equity section of the balance sheet. The income statement formula (see above) is used to produce a simple, one-step income statement, however, many companies prefer to analyze their business’ financial status with a more complex, multiple-step income statement because it provides greater detail over the one-step form. Multiple step income statements separate operating costs and income from other activity unrelated to such expenses, such as depreciation, or interest charges in relation to borrowing. Analyzing operating and non-operating income is important because it helps companies view the income they are generating, which in-turn, helps them thrive in the long run. Non-operating income can include investments, property, asset sales, as well as other gains, however, these forms of income are atypical and cannot be relied on for financial success. A profit and loss statement can be prepared by the owner of the company or the accountant. Some accounting programs can also help you put together a profit and loss statement. FormSwift’s profit and loss statement template is created for business owners who need to easily create the document and do not have access to a program generated option. Should I create one on a monthly basis? You can do that if you want. If your business is new, creating a monthly profit and loss statement can help you determine where you need to cut expenses. However, most companies create a profit & loss statement on a quarterly basis. Below is a step-by-step guide to help you identify each section of a profit and loss statement, as well as its description. Period of Time: profit and loss statements cover specific periods of time. This period can be a month, a quarter, or a year. Time Period: this information is transferred from the period of time above. Revenue from Primary Activity: this includes the revenue from your company’s primary source of income. Costs/Costs of Revenue: the cost of revenue is the amount spent on things related to your businesses primary activities. For example, if a company sells iced tea, the costs of revenue would include the cost of the water, the tea, and other expenses, such as bottles and sweetener. 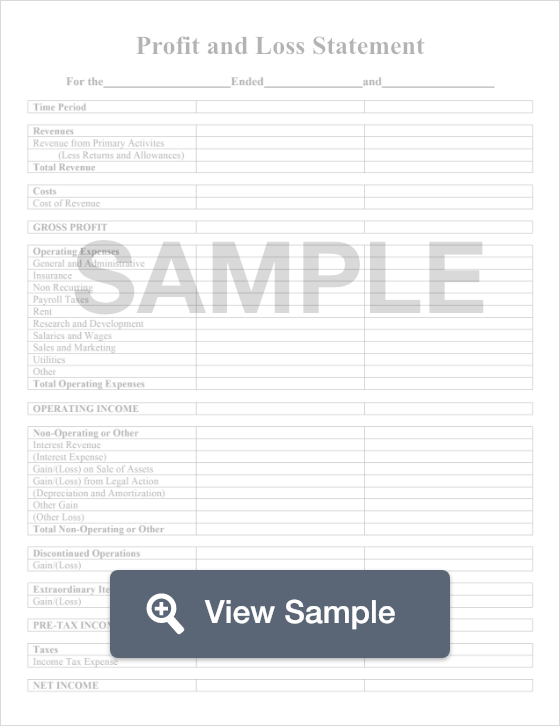 It’s important to mention that many companies who are service-based generally leave this section blank and include their costs under “Operating Expenses” (see below). Gross Profit: this is calculated by costs from total revenue. Operating Expenses: this includes expenses that are unrelated to the primary activities of your business. These expenses can include employee wages, rent payments, and advertising costs, but are different depending on each business. General and Administrative: this box generally pertains to business operations, such as rent, utilities, and administrative expenses. Insurance: this section includes insurance payments regarding the business. Non-Recurring: these costs are generally atypical costs such as theft or legal costs. Payroll Taxes: this box is to reflect any payroll taxes your business may have paid this period. Rent: this reflects the rent paid during this period. Research and Development: this reflects costs paid for market research and development of the company. Salaries and Wages: this reflects the sum of money paid to employees during this period. Sales and Marketing: this box reflects the sum of money paid toward advertising costs, and other costs accrued to sell products. Other: this box reflects other operating expenses that may not fix in one of the boxes above. 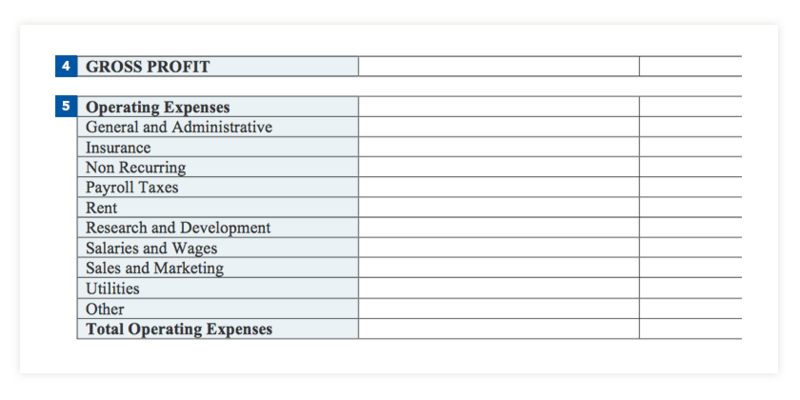 Total Operating Expenses: here is where you total all of the boxes under “Operating Expenses” and write the sum. Operating Income: this number is calculated by subtracting total operating expenses from operating income. Interest Revenue: this box is used to account for interest earned, perhaps from investments, or savings accounts. Interest Expense: typically accounts for interest paid, perhaps for borrowing or purchasing items on credit. Gain (Loss) on Sale of Assets: this accounts for the sale (or loss) from assets, such as buildings, space, or machinery. Gain (Loss) from Legal Action: this box accounts for sums gained or paid as a result of legal action. (Depreciation and Amortization): Amortization accounts for the cost of intangible assets, such as licenses and permits, while depreciation is the loss of value from tangible assets, such as vehicles, or machinery. Other Gain: this box would reflect gains that would not otherwise fit in the categories above. (Other Loss): this box would reflect losses that wouldn’t otherwise fit in the boxes above. Total Non-Operating or Other: This is the sum of the numbers above. A total non-operating loss is reflected in parenthesis. Discontinued Operations: this box reflects gains or losses from discontinued merchandise or services. Extraordinary Items: this box reflects gains or losses from rare or unique circumstances. Pre-Tax Income: pre-tax income is the sum of operating income plus total non-operating or other, plus (or minus) gains or losses. Taxes: income tax expenses should be reported here. Net Income: net income is calculated by subtracting tax expenses from pre-tax income. The final figure is the number that shows a company’s profits or losses for the period and is the final step of an income statement. There you have it! By now you should have a clear understanding of what a profit and loss statement is and how it can help you better understand the financial health of your business. A profit & loss statement is an important financial statement that your company will use to not only secure possible loans or investments but will also provide insight on areas where your company can grow and where it can potentially cut back. Using the step-by-step guide above, you can create your own income statement with ease regardless if you run a small business or operate a major corporation. A profit and loss statement is a financial statement that is prepared for a business. A profit and loss statement covers a stated amount of time (such as a quarter or a month) and lists the revenue, all costs, and expenses that are associated with the business during that period of time. A balance sheet can give a business an idea of its financial health during a listed period of time. The balance sheet shows the assets, the liabilities, and capital that is available in the business. Businesses create income statements as a way to review their revenue and their expenses. Income statements are generated to cover revenue and expenses for a certain amount of time. A purchase order is a document between a buyer and a seller. The purpose of a purchase order is to act as a physical inventory of the goods that are being sold by the buyer to the seller. It should include the date the agreement was made, the items being sold, the price for each item, and the identities of the buyer and the seller.